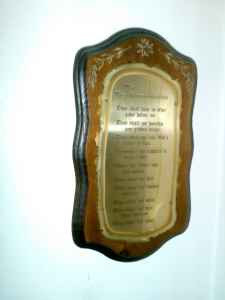 the Ad>>Wall Plaque of the Ten Commandments. Beautiful piece of art display for any wall. Measures 12"X 18". I have two and letting one of them go. $14.00 dollars. After some extensive research I discovered that "thou shalt not lie" is not a commandment...it's not even a suggestion. So you are totally in the clear calling this a "Beautiful piece of art". However-Commandment #2: 'You shall not make for yourself a carved image--any likeness of anything that is in heaven above, or that is in the earth beneath, or that is in the water under the earth. Bummer, dude! This carving violates the rules. Oh cruel irony.